Their lives can be very different, and some radiologists expect separate futures for interventional and diagnostic practices. Sometime late next year, the interventional and diagnostic radiologists at a large hospital not far from Detroit will no longer practice together because the interventional radiologists will establish their own clinical practice. To others in radiology, those are fighting words. They believe it would be a mistake for interventional and diagnostic radiologists to separate and hope that Weiss’ prognostications are wrong. “At this point in time, the big picture approach from the Society of Interventional Radiology standpoint seems to remain that there is value in maintaining diagnostic and interventional radiology within one house,” says Gregory Soares, MD, director of IR at Rhode Island Hospital, medical director of the Rhode Island Vascular Institute, and an associate professor of diagnostic imaging at Warren Alpert Medical School of Brown University in Providence. The separation of IR and diagnostic radiology has been 20 years in coming, Weiss says. “I’ve been hearing the conversation for years,” Ellenbogen confirms. 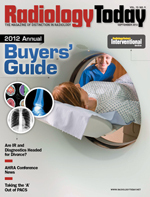 Numerous factors have accelerated the discussion of late, including dwindling reimbursements for imaging, the emergence of teleradiology services, advances in and growing demand from patients for minimally invasive procedures, and increasing competition among medical specialties for interventional procedures. Other specialists, including cardiologists and vascular surgeons, provide some of the same image-guided procedures as interventional radiologists, particularly angioplasty and ablations. A lot of the issue is economics, says Daniel Corbett, RT, CPC, cofounder and chief of business development for Radiology Business Solutions. “Everyone wants his share of the financial pie, but the financial pie in imaging is shrinking,” he says. The imaging industry has seen significant cuts in reimbursements over the last five or six years, and the trend isn’t likely to be reversed any time soon, if ever. IR is expected to take even bigger hits in reimbursements as more procedures are bundled in the hospital, Corbett say, As a result, he thinks new practice arrangements will need to be developed. These new arrangements may mean more freestanding IR clinical practices dedicated to peripheral vascular disease, he says. Interventional radiologists also may join cardiologists and vascular surgeons at outpatient-only vascular centers where they each do their own interventional procedures. Corbett says cardiologists and vascular surgeons have taken the majority of particularly lucrative interventional procedures from interventional radiologists. For radiology groups and their interventional radiologists to retain their share of these procedures—procedures interventional radiologists have invested a lot of time and effort in learning and like to do—Corbett thinks they may need to establish clinical practices and compete. “And if they want to grow and develop interventional practices, they can’t be tied to the radiologists’ reading room,” he says. Weiss says clinical IR practices are time consuming. “It means office hours, examining patients, following up patients, and dealing with comorbid conditions … basically being a doctor, not just a technician.” But, he says, interventional radiologists who want to do interventional procedures know it’s different from interpreting imaging studies and don’t mind. “It is difficult to compete in interventional radiology without doing clinical. Vascular surgeons and cardiologists may be providing better service. If you’re an interventional radiologist and you don’t compete, you may fail because you’re not playing by the same rules,” he says. Diagnostic radiologists often see the time and money put into operating a clinic and building an IR practice as resources that drain the group. They feel the doctor’s time would be better spent generating revenue for the practice in the reading room. Weiss believes more interventional radiologists haven’t broken away and established their own clinical practices because they want to retain diagnostics as a fallback. “It can be scary when you don’t have diagnostics as a safety net,” he says. Likewise, interventional radiologists can be a source of outpatient referrals to the hospital or diagnostic radiology group when their patients need follow-up care, Soares notes. Corbett agrees: “The interventional radiologists provide a connection to the medical staff that diagnostic radiologists need. The hospital can say, ‘If all you’re doing is reading images, what difference does it make if you’re here or not?’” Having interventional radiologists in a group can help it maintain a hospital contract because someone (typically an interventional radiologist) has to do the hands-on procedures, the radiologists concur. Ellenbogen, who specializes in sonography, says the practice of IR needs to stay within diagnostic radiology because there’s strength in numbers. He says radiologists will have a stronger voice before the Centers for Medicare & Medicaid Services and federal rule makers who set healthcare policy and determine reimbursements “when we speak together rather than fragmented areas.” Radiologists have enough difficulty fighting the challenges from colleagues who want to perform imaging—the urologist, the neurologist, the orthopedist. “We are better able to deal with these issues as a combined entity rather than as separates,” he says. Ellenbogen doesn’t believe a group’s interventional radiologists should be required to do “barium enemas on Tuesdays and pediatric CT scans on Fridays and interventional radiology only on Thursdays. That is not in anybody’s best interest,” he says. But if part of the interventional radiologists’ duties “include looking at a number of cross-sectional imaging studies and reporting them out, most would relish the opportunity,” he says. Fueredi does mostly IR, but when he’s not doing procedures or seeing patients in the clinic, he’s happy to jump in the healthcare system’s PACS and read studies. “I can pick up all kinds of things and read them,” he says. “That’s what my idea of a day’s work is. I can help with diagnostics, and that’s what being a colleague is all about.” If the interventional radiologists were a separate group, there wouldn’t be that give and take, he says. But Fueredi recognizes that what works for him and his practice may not be ideal for every group. He expects that as the debate whether interventional and diagnostic radiologists should separate continues, different solutions will be found. — Beth W. Orenstein of Northampton, Pennsylvania, is a freelance medical writer. She is a frequent contributor to Radiology Today.